Introducing a new drug to market is a complex and time-consuming process that can cost pharmaceutical companies an average $2.6 billion and ten years of research and development. There are multiple defined stages for this process, each with their own associated challenges, timelines, and costs. 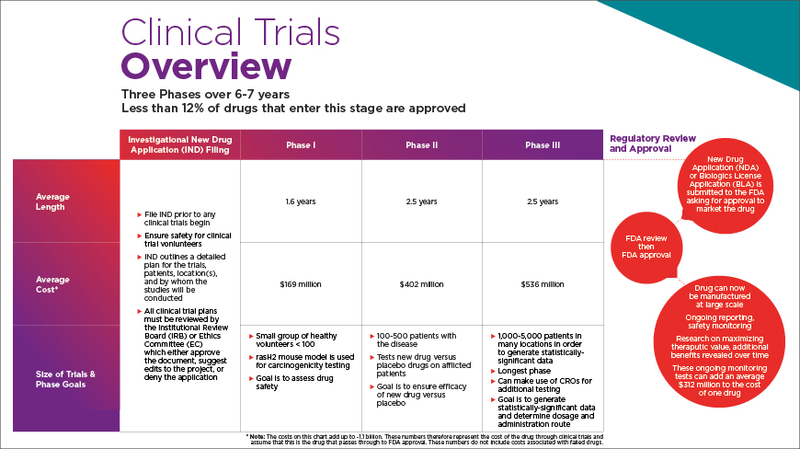 This review will discuss the entire process, from target discovery through clinical trials and post-approval monitoring for the development of a new drug. During the first phase, known as target discovery, in vitro research is performed to identify targets involved in specific diseases. A target is usually a molecule integral to gene regulation or intracellular signaling, such as a nucleic acid sequence or protein. In order to decide on which target to focus research efforts, one needs to ensure that the molecule is "druggable" — that its activity can be modulated by an exogenous compound. After selecting a potential target, researchers must demonstrate that it is involved in the progression of a given disease and that its activity can be regulated. Conducting careful and precise target validation experiments is essential for the success of drug development in the following stages. Lead compound identification is the process of identifying or creating a compound that can interact with the target previously selected. Researchers can conduct screening experiments to identify possible naturally-occurring compounds that can be re-purposed as drugs. Alternatively, synthetic compounds can be designed that will both target the predicted target while not interfering with other cellular processes. In addition to testing the mechanism of action of the drug, initial safety tests are conducted in cell culture. Both the pharmacokinetics and pharmacodynamics of the drug are also tested — how it is metabolized and how it affects various bodily functions, respectively. Once a compound (or compounds) have been identified, they need to be optimized for efficacy and safety. The design of synthetic molecules can be altered to prevent off-target binding, making them less likely to interact with molecules other than the target. Additionally, the optimal dosage and introduction route (oral, injection) is tested on two- and three-dimensional cell culture platforms. This stage also includes safety testing prior to introduction into multiple in vivo animal models in the following preclinical development stage. Animal models such as mice and rats can be used at this stage, however some tests for safety are first conducted in vitro. One specific example of a three-dimensional platform is a scaffold developed for the testing of new glaucoma drugs (Torrejon, KY, 2013). Glaucoma can result from increased intraocular pressure in the eye, which is directly related to the outflow of aqueous humor through a structure called the trabecular meshwork. The scaffold developed is a three-dimensional trabecular meshwork which effectively mimics the microenvironment around the eye. By screening drugs first in this 3D in vitro setting, animal models used in the next stage will have better chances of encountering a safe and effective drug. The preclinical stage of drug development involves extensive testing in animal models to determine if the drug is safe for human trials and it if it performs as it should. Specifically, side effects of the drug need to be monitored and addressed. In order to progress from this stage to clinical trials, the FDA requires extensive testing and data. At this point, companies have spent an average of $500 million on R&D for this drug. Since the next stages of development will cost upwards of two times that amount, it is essential that preclinical testing can be as accurate at determining the potential success of the drug as possible. Animal models that mimic human conditions, such as knockouts or genetically-modified mice, are used during this stage. While the chances of a drug making it to phase III clinical trials is just 12%, the development company is also expected to produce estimates for the scale-up of a drug if it succeeds. Due to the nature of the drug development process and the cost of research up until this point, it is rare that an IND is submitted and then canceled by the FDA. Most times, the FDA suggests improvements to the clinical trial process being proposed and allows the release of the IND. During phase I of clinical trials, the new drug is tested on 100 or less healthy patients to determine the relative safety of the medication. This phase also includes carcinogenicity testing on mouse animal models, specifically the Tg rasH2 mouse, which is used to predict the carcinogenic potential of chemicals. This mouse model carries the human c-Ha-ras oncogene in addition the endogenous mouse Ha-ras oncogene. The presence of the human copy of this gene makes the model highly susceptible to developing tumor after exposure to compounds that cause cancer in humans. This model had reduced the time associated with carcinogenicity testing from two years down to six months. During phase II, the amount of patients increases to a group of 100-500 and the drug's effectiveness is studied. These patients have the disease that the new drug is attempting to treat. Adverse events, side effects, and efficacy are all tested in this phase. Other questions that are asked are the optimal dosage, frequency of intake, and the effect it has on the condition in question. In Phase III trials, researchers study the drug a group of about 1,000-5,000 patients in order to generate statistically significant data. Only 12% of drugs make it through this stage, as it is key to determining the overall safety and efficacy of the new medication. If a drug is able to pass through this stage, data obtained from the larger group of patients provides the basis for the future labeling of the prescription. After clinical trials have succeeded, a New Drug Application (NDA) is submitted to the FDA for review and potential approval. The purpose of this document is to demonstrate the clinical trials proved the safety and efficacy of the drug, and that it is qualified to go to market. Lots of data is required for this, including information about all phases and studies, clinical results, safety precautions, and potential interactions with other medications. The review process can take anywhere from six to ten months. If a drug is approved at this point, the labeling processes begins, which is the development of prescribing information that accompanies all prescription medications in the US. What most of the population does not realize is the amount of post-approval monitoring that pharmaceutical companies need to conduct while their drug is on the market. Some data obtained from this phase are unpredicted serious side effects, interactions with other drugs, potential alternate uses, and modifications to dosage.